The benefits of UK designed and manufactured plastic security seals were demonstrated to thousands of visitors attending one of the Midlands largest manufacturing exhibitions. Talisman Security Seals, part of Malvern-based Talisman Plastics, showcased its innovative, British made products at the Made in the Midlands event at the Ricoh Arena in Coventry, alongside over 300 other companies exhibiting at the event. The most significant event in the history of the MITM organisation, thousands of delegates from manufacturers to suppliers from throughout the region and the UK attended. “We’re very proud of being a Midlands-based manufacturer. MITM is not only a celebration of manufacturing in the region, but it is also a showcase of the wide and varied sectors and industries we have here,” said Shaun Champion, managing director of Talisman Plastics, one of the leading designers and manufacturers of precision plastics injection moulding. Made in the Midlands is an industry body representing more than 400 manufacturing SMEs in the region. Established in 2009, this was its ninth exhibition and the largest to date. As well as acting as a voice for the region’s industry regionally and nationally, it hosts a range of events, awards and networking opportunities, promoting inter-trading in the region. “We’ve had some good leads from the MITM exhibition. It demonstrates how such a regional event can benefit businesses like ourselves who are passionate about the Midlands,” added Shaun. 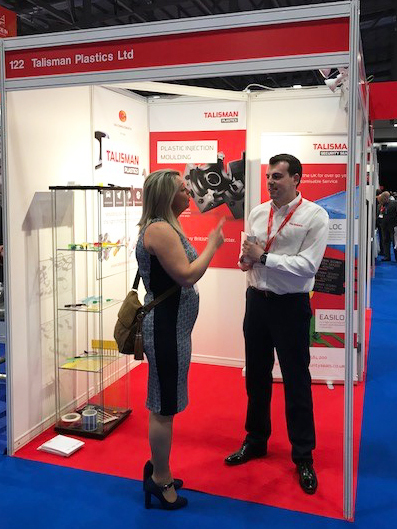 The expo was also an opportunity for Talisman Plastics to showcase under its new brand, having previously been known as LGG Charlesworth, a leader in the UK plastics injection moulding industry for almost 100 years. From 1 June the company was rebranded and incorporating three trading divisions, including Talisman Security Seals and, Talisman Caps and Closures. “The response to the rebrand was again very positive, demonstrating our authority within the plastics injection moulding sector,” said Shaun.